Infiniti Repair in Boulder, CO by Master Mechanics. Call (303) 449-8949 to Book a Free Initial Auto Repair Assessment. Nissan conveniently dropped its Datsun brand in America two years after our owner, Bill Bender, opened Independent Datsun here in Boulder, CO. So, we updated our shop’s name to Independent Motors and Nissan doubled down on the styling and performance that earned the automaker a niche following in the ’70s and ’80s. And we’ve been doing Nissan Repair as needed ever since. The ’80s were a decade of growth for both our shop and Nissan. We brought on some extremely skilled master automotive technicians, and Nissan went full-bore with its R&D unit. The result? In 1989, Nissan debuted the famous R32 Skyline in Japan and introduced its brand-new luxury Infiniti car brand in the United States. So, as Infiniti embarked on this new way of imagining the relationship between customer and automaker, we were busy trying to bring that same ethic to community auto repair. And more than a quarter century later, we still see in the modern Infiniti the things we loved in those old Datsun two-seaters. The first Infinitis sold in the US — the Q45 and the M30 — underwhelmed many car buyers. All throughout the ’90s, Infiniti tried to tweak things like features, design and owners’ clubs, but it struggled to keep pace with Lexus and Acura (to the point that Nissan thought about shutting Infiniti down during the Japanese financial crisis). That re-focus on performance changed everything. In the early-2000s, the company struck gold with its G35 coupe, Motor Trend’s 2003 Car of the Year. That helped propel sales: In 2003, Infiniti sold nearly 42,000 more vehicles than the year before. Spirited performance and sleek styling have become hallmarks of the Infiniti brand. “When I was brought in, there were certain things building,” Infiniti Executive Design Director Alfonso Albaisa tells Car & Driver about his arrival at the company in 2012. 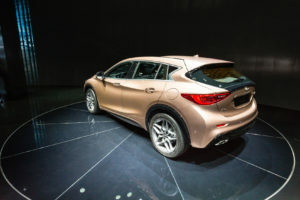 “Shiro [Nakamura, Infiniti’s chief creative officer] didn’t want radical change so much as he wanted a deepening; to make it obvious what we wanted to do. Safety is also a matter always at the forefront of Infiniti design. In 2015, the Infiniti Q50 sport sedan and the Q70 luxury performance sedan earned the Insurance Institute for Highway Safety’s (IIHS) highest safety award, Top Safety Pick+. In 2001, it introduced rearview monitors. In 2004, It introduced its Lane Departure Warning system. In 2007, It introduced a camera that gives you a 360-degree view of your surroundings when parking as well as a Lane Departure Prevention system. In 2012, it introduced a system to intervene in the event of an imminent collision when the driver is backing up. Cars as safe, stylish and technologically advanced as your Infiniti still need to be maintained and serviced from time to time. That’s why we have master mechanics on our staff that specialize in Infiniti repair and maintenance. Be it an Infinity car, truck or SUV, we use state-of-the art diagnostics tools that allow us to do preventative maintenance. We’ll identify any would be or even minor repair issues while they still minor and easily fixed. 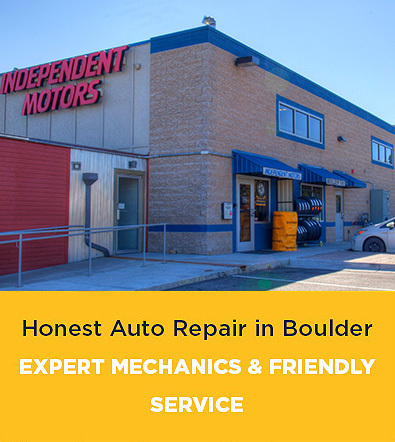 Call Independent Motors today at (303) 449-8949 for the best in Infinite repair and auto repair in Boulder, CO. You’ll be glad you did!